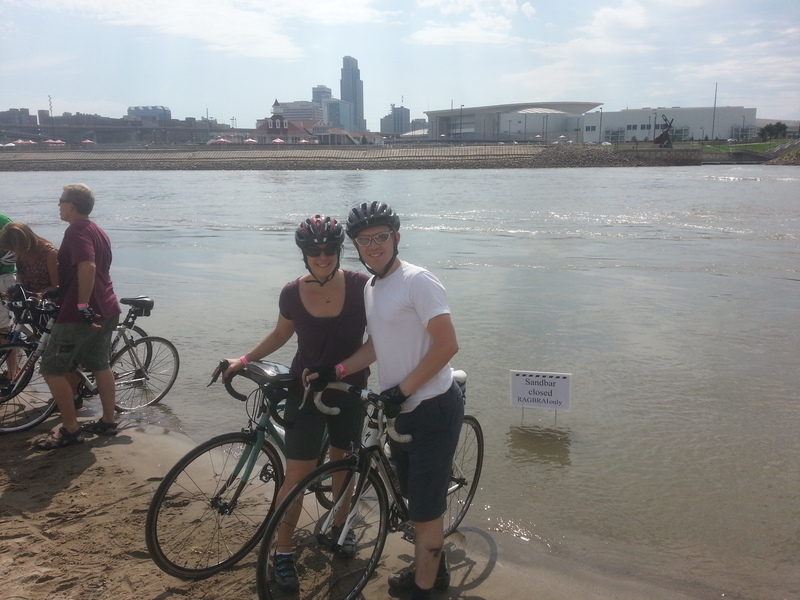 Tara and Simon’s RAGBRAI Part 1 of 4: Why Iowa? Every year in the final full week of July, thousands and thousands of people participate in the Register’s Annual Great Bike Ride Across Iowa (RAGBRAI), a west to east ride through the state from the Missouri River to the shore of the Mississippi. As many readers know, Iowa is my home state. Growing up RAGBRAI intrigued me, in part because it seemed a long way to ride one’s bike, and also because of the numbers of people who wanted to spend their free time passing through small Iowa towns like mine. When I learned that Tara and Simon of Wheaton, Maryland– touring cyclists, coffeeneurs, and regular readers of this blog– were doing this year’s edition of RAGBRAI, I asked if they would be willing to put a report together capturing their experience. They agreed, and Tara penned a fantastic story (thank you, Tara!! ), which I’m featuring over four posts. Today, we kick off with Part 1: Why Iowa. Over the last two years, Simon and I have been improving our cycling from casual weekend novice to serious weekend novice. A bike vacation seemed like a fun way to challenge ourselves and test the progress we’d made. 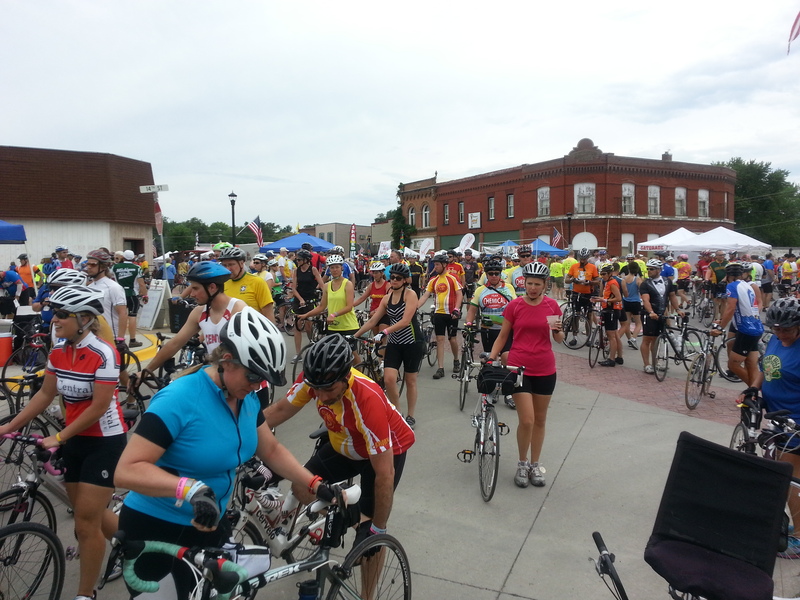 I don’t remember how we first learned about RAGBRAI (maybe it was even this very blog? ), but its description appealed to us. Beyond being a week-long bike ride, RAGBRAI has a reputation of being a rolling party of music, food, and friendly people. RAGBRAI also seemed like a perfect opportunity to see a part of the country that we, quite frankly, would have not otherwise visited. The daily mileage (about 50 miles a day this year) was enough to feel that we were accomplishing something each day, but not so much that we couldn’t enjoy the scenery and check out the quirks and charms of the small towns we’d be passing through. After explaining to our friends and family how we were spending our week’s vacation, however, most of them remained skeptical that riding our bikes across the entire state of Iowa with 10,000 other people would be fun. Rather than driving to Iowa with our bikes, we flew to Des Moines and shipped our bikes via High Country Shipping, the official bike shipper for RAGBRAI. When we arrived at Council Bluffs, the start town, our bikes had been re-assembled by a local bike shop and were ready for us to pick up. Due to the size of the overnight towns, camping is virtually the only mode of accommodation. Lacking contacts in Iowa that would put us up for the night, we paid for a charter service to take our luggage and set up our tent and air mattress every day. Our bags would be waiting for us outside our tents when we reached camp each afternoon. The charter service, staffed primarily by teenagers, also provided a large canopy with camp chairs, cold soft drinks, and a charging station for cell phones and bike computers. The service also covered the two-hour bus rides to and from Des Moines to Council Bluffs, Iowa, on the Iowa-Nebraska border. This year’s route was the second shortest in RAGBRAI history— “only” 406 miles, although between extra trips here and there and the additional miles to actually get to our campsite as opposed to the town limits, our total mileage for the week was closer to 430. To benefit from prevailing winds (or at least to avoid the worst of the headwinds), the RAGBRAI route starts in the west of the state and travels east to the Mississippi River. Most days, the mileage was around 50 miles, with the second day being 83 miles, and the last day, 63 miles. All told, there was about 16,000 feet of climbing. For most of the ride, we were very lucky with weather: low humidity, temperatures in the low 80s, and a tailwind more often than a headwind. In our conversations with other riders, this was constantly contrasted with 2012’s ride, which presented temperatures close to 100F, high humidity, and headwinds. Tomorrow: Time to ride! 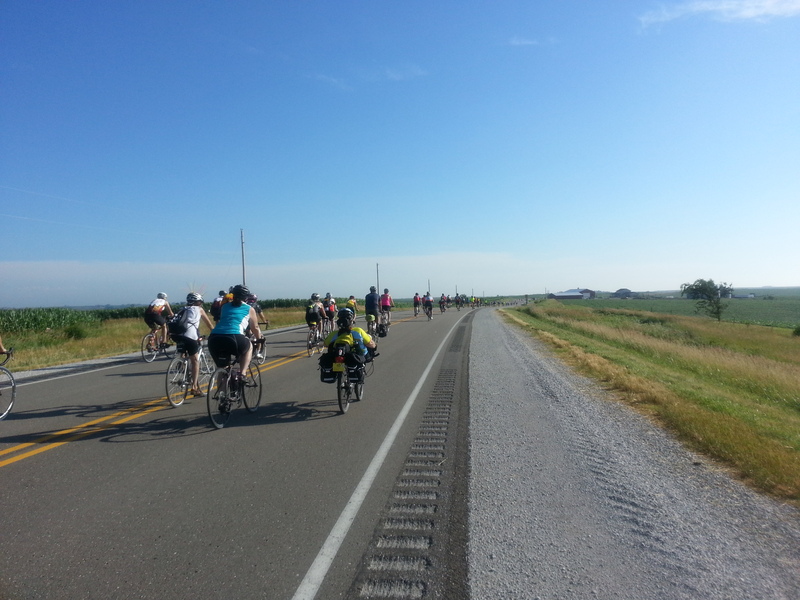 Tara and Simon make their way across the Hawkeye state with thousands of other riders. 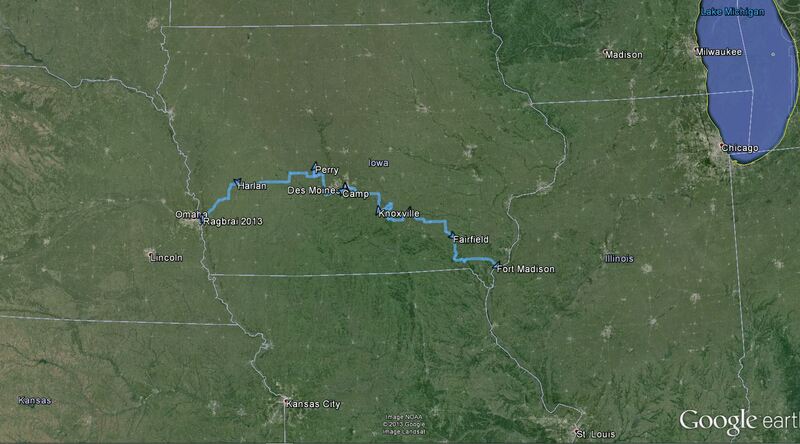 RAGBRAI is on my short-list of rides being considered for 2014. Any idea when they post next year’s route and dates? The route is typically announced towards the end of January. True to their reputation as a rolling party,they throw another one just to announce the route. My guess is that it’ll start somewhere in the west/central part of the state, probably within 80 miles of Sioux City. I’ve also heard that Southern routes are more… um… “accessible” shall we say, and the rides get more difficult as the routes progress north. True? From a topographic standpoint, the NW corner (where I live) is about as flat as it gets, it’s all I can do to find a hill with a grade steeper than 4%. Iowa’s no pancake though, expect any route to deal you almost continuous rollers. That’s true of almost any part of the state. Generally as you move SE the hills get a bit closer together and a bit taller. In the end, the difficulty of any route across Iowa is determined by the weather. If you’ve got a headwind or a crosswind there is absolutely nowhere to hide but the draft of the people around you. As mentioned, last year had multiple days of 100+ degrees and some nasty winds. Had a guy down with a heart attack not 6 miles from the start of the first day. Luckily there’s no shortage of EMTs and doctors among the masses so he ended up alright. There are whole teams that try and predict the route so that they can bookmark accommodation as fast as they can. Or did the directional issues emerge only recently? Oh yeah, about that. It was a test to make sure you were paying attention. That’s it. Good catch, I’ll make the edit!